NASA's DC-8 airborne science laboratory has returned to its base after completing the six-week GCPEx snowfall precipitation mission in eastern Canada. 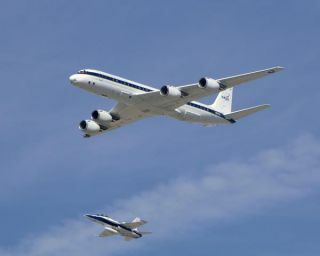 After spending more than 80 hours flying above wicked Canadian snowstorms, NASA's DC-8 airborne lab has returned home. The data-collecting flights were part of NASA's snow study over Ontario, Canada, called the Global Precipitation Measurement Cold-season Precipitation Experiment, or GCPEx. The goal is to help scientists match measurements of snow in the air and on the ground with measurements to be taken by the Global Precipitation Measurement satellite, due to launch in 2014. "The GCPEx mission has been a real success," said study team member Walter Petersen, of NASA's Wallops Flight Facility in Virginia, who has plenty of experience measuring snowfall. "The majority of the mission objectives were accomplished, especially as they pertain to collecting a broad spectrum of snowfall, mixed phase and even rain precipitation events." During the mission, the DC-8 flew above the clouds as a Cessna Citation from the University of North Dakota and a Convair 580 from the Canadian National Research Council flew through the clouds and measured the raindrops and snowflakes inside. The last mission, on Feb. 24, was a 6.8-hour flight over a storm system in the Boston area, followed by multiple passes over the Environment Centre for Atmospheric Research Experiments, or CARE, in Egbert, Ontario, and over storms above Lake Ontario. Prior flights also targeted the CARE area, and additional passes over Lake Ontario captured good mixed snow and rain data. "All indications are that the airborne and ground-based instruments worked very well, meaning we expect to have a robust set of data to analyze toward supporting the development of GPM falling-snow retrieval algorithms," Peterson said. This story was provided by OurAmazingPlanet, sister site to SPACE.com. Follow OurAmazingPlanet for the latest in Earth science and exploration news on Twitter @OAPlanet and on Facebook.